Hayles, N. Katherine. 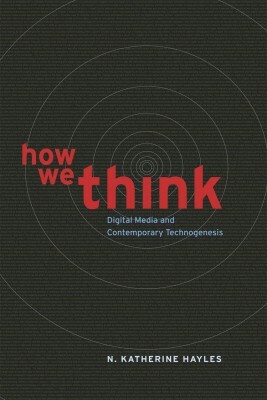 How We Think: Digital Media and Contemporary Technogenesis. Chicago: University of Chicago Press, 2012. 280 pages. Since the 1970s, N. Katherine Hayles has been exploring the zones of contact between the cultural formations of technology and the technological basis of culture, working between what C. P. Snow called “the two cultures” of humanists and scientists.1 Hayles’ previous works include How We Became Posthuman: Virtual Bodies in Cybernetics, Literature and Informatics (1999), and Coding the Signifier: Rethinking Semiosis from the Telegraph to the Computer (2002), where she productively joined computer science, communication history and interpretations of classic and avantgarde literature. The common ground between these fields lies in the patterns, temporalities and structures that cultural forms exhibit to understand the neurological, psychological, and cultural impact of new technologies. How We Think is organized around the term technogenesis, by which Hayles means “the idea that humans and technics have coevolved together” (10). Putting an accent on the social dimension of developing and using technology, Hayles proposes to see “technical objects as … temporary coalescences in fields of conflicting and cooperating forces” (86). Such a shift in perspective is warranted because the humanities have left their own practices of knowledge production and their dependence on information technology unexamined for a long time. How We Think thus addresses the materiality of humanist thinking at a time when it has been exposed in its professional conventionality through the pervasive, and seemingly immaterial, practices of digital media. Hayles discusses technogenesis through examples from new media productions such as Steve Tomasula’s TOC: A New Media Novel (2009), and Steve Hall’s The Raw Shark Texts (2007), a database narrative which exposes the asynchronicities of neuronal and machine temporality. By far the most interesting chapters, however, are the previously published “How We Read: Close, Hyper, Machine” (chapter 3) and the previously unpublished historical study “Technogenesis in Action: Telegraph Code Books and the Place of the Human” (chapter 5). Chapter three deals with the crisis of close reading in the age of digital hypermedia. Although authors like Ted Striphas (The Late Age of Print, 2009) or Roger Chartier (A History of Reading in the West, 2003), among others, have analyzed the historical conventionality of reading practices, especially digital hypermedia have created a new sense of urgency among scholars trained in print-based methods of thinking. Hayles, in contrast, rejects the elitist criticism that “people read less print, and they read print less well,” preferring to look at how hypertext reading and machine reading, i.e. the automated analysis of big data, can offer different entrance points for interpretation and yield new connections in unrelated sets of texts (56). She refutes at length the jeremiad echoing through Nicholas Carr’s The Shallows (2010) about the demise of reading ability in the digital age, by pointing out that studies of neural activity are themselves deeply culturally coded and can be provisional at best. Her lengthy discussion of Carr here is somewhat surprising. Although a popular critic of digital culture, Carr hardly counts as a heavyweight in academic debates. His provocative question whether “Google is making us stupid” is an easy target for Hayles’ more nuanced argument on technogenesis. Instead of juxtaposing old and new modalities of reading, Hayles argues that “close, hyper, and machine reading each have distinctive advantages and limitations” (74). The researcher’s task is to evaluate the benefit of each of these different modalities—for parsing global patterns as well as minute analyses. This balancing of methods may eventually prove more fertile than Franco Moretti’s method of ‘distant reading’ (Graphs, Maps, Trees, 2005), or Lev Manovich’s resource-intense ‘cultural analytics.’ The combination of data collection, analysis and interface design requires digital humanities projects to join competencies of technicians, programmers, graphic artists, and academics. But new forms of research also enforce more cooperation among researchers beyond the truism of interdisciplinarity, including the involvement of corporate sponsors in knowledge production. Hayles’ argument about technogenesis is further expanded in chapter five, a study of telegraph code books from the end of the nineteenth century. The telegraph required human operators who were physiologically disciplined to correctly hear and reproduce telegraph beep tones within very short intervals. But since telegraph communication was error-prone and public, code books were needed to keep confidential messages short and private. Hayles traces the transformation of these code books from relatively simple collections of customary phrases to dynamic coding algorithms which helped to transform any natural language expression into untraceable combinations of letters. Code books standardized communication by introducing an encoding/decoding algorithm into the transmission of natural language expressions. This foreshadows the emergence of binary code: “The progression from natural language to artificial code groups … traces a path in which code that draws directly on the lifeworld of ordinary experience gives way to code calculated procedurally” (142). Digital code became a universal language of global communication—and it was written in English. In this condensation of ideas, Hayles successfully grounds technogenesis in a thorough analysis of historical media practices and technology. How We Think attempts a sort of reverse engineering of humanist modes of inquiry through its focus of technogenesis both in its contemporary manifestations and its residual traditions. By making use of the humanist and scientist vocabularies, the book represents a new model of humanist writing, one that is avowedly concerned with the material aspects of epistemological practices. Yet, although individual chapters offer insightful analyses of the concept, the book cannot fully elucidate the issue of “how we think.” This is mainly an editorial problem. The frequent cross-references between chapters attempt to patch together a sense of overall cohesion the reader might find lacking. Brief interludes on such broad subjects as “Practices and Processes in Digital Media” are an editorially weak measure to give coherence to a collection of strong but separate texts. Ultimately, technogenesis is a compelling concept worth exploring but its scope clearly far exceeds the studies used to support it in How We Think.